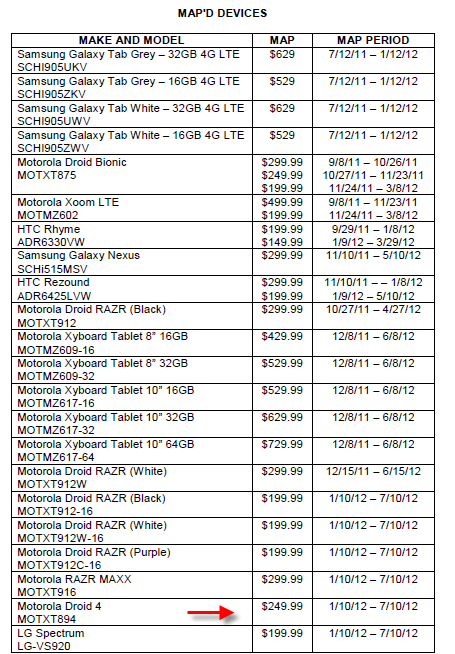 The newest Verizon MAP (minimum advertised list) is out and it includes all of the newest CES announced devices. The RAZR MAXX, LG Spectrum and DROID 4 all on there. Thanks to press releases, we had already seen pricing info for the MAXX and Spectrum, but nothing so far on the D4. If this MAP list is correct (and they almost always are), then it should be available at launch for $249 on new 2-year contract. It’s not quite the semi-bargain price of the Spectrum, but it’s better than $299. We are still without a release date.